Seriously how much our pets do for us. In return we also have to do something extra for them. Hmm, i know where we are going. Yes we can give them extra love and also homemade treats. So today as usual i am going to share 5 bowl licking dog treats recipes. With which most of you are unfamiliar. Sometime we really don't want to spend time for baking stuff. To help you with that, here's no bake recipe which is easy to make and definitely save you some time. 1. Beat pumpkin puree, peanut butter and milk at medium-high in mixing bowl or you can also use spatula. 2. Gradually add 2 ⅓ cups of oats in mixture. 3. Using small scoop or spoon roll small balls out of mixture, after it slowly roll balls over the rest of oats. 4. Cover and place in refrigerator for about an hour or until they're firm well. This recipe is full of nutrients, beneficial for your dog's health. The ingredients used in recipe are great source of minerals and fibers. The fiber content present in recipe will help you to manage your dog's health. 2. Cook for 8 hours on low and for 5 hours on high. 3. When cookies done stir, break chicken into small pieces. 4. Let it cool and serve. 5. Left portion could be fresh for three days in refrigerator. If your dog love meat then simply give him this meatball treat he will love it and demand again and again. 1. Pre heat oven to 350° F. Put all ingredients in large bowl and mix make sure all ingredients mix well with each other. 2. Make meatball for the mixture, size as you want. 1 inch balls are good probably all dogs. 3. Place balls on non stick aluminium foil. Bake for 15 - 20 min depends on size of balls. If you made smaller then cook less if you made large then cook for bit long. 4. Put balls on wired rack to cool and serve. This recipe is easy homemade dog diy treat type. 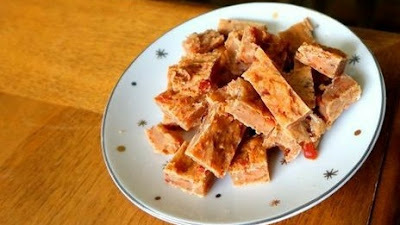 It only have 3 ingredients, easy to make just simple delicious treat. Your pup will love this. 1. Pre heat oven to 350° F. Take large bowl and mix entire can of salmon (water and all) use two folks to mix it well and speed up the process. 2. Add flour and eggs to mix and mingle it well until you have nice sticky fish mess. 3. Line parchment paper one cookie sheet, flatten sticky fish mess on parchment paper. The thinner the mix will the crunchier it will turn out. 4. Bake it in oven for about 30 min. If your treat is thick then using 2 spatulas flip it and bake for extra 15 - 20 min. 5. Once it baked bring it out on wired rack to cool, once it cool down cut into pieces and serve. That's it for this blog. I definitely want to know weather you tried these recipes or not or if you tried how's your experience and did your dog liked it. Every write below in comment section.